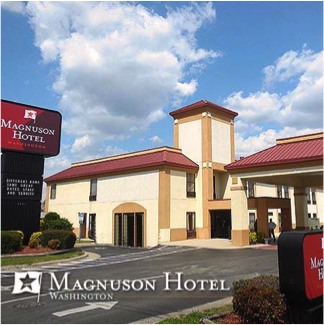 Magnuson Hotels announced today its 200th Choice Hotels franchise conversion, the Magnuson Hotel Washington located in Washington, North Carolina. Formerly the Quality Inn Washington, the hotel will upgrade its local, regional, and national market positioning to attract travelers via an affiliation with Magnuson Hotels’ global portfolio of nearly 2,000 hotels. Driving the rapid growth of Choice Hotel conversions to the Magnuson brand are Magnuson’s growing consumer awareness and recent certification to the US Franchise Registry, the national listing of brands approved by the US Small Business Administration (SBA). Total 2014 YTD Magnuson Hotels brand growth has risen 40% over same period 2013. The 58-room hotel is located near the historic waterfront district of Washington, North Carolina off US Highways 17 and 264. Nearby attractions include the Washington Civic Center, Belle of Washington, Goose Creek State Park, and the Turnage Theater.